Meet Sai Teja Peddineni, India’s first volcano climber, who gets a high on being precariously close to death. It’s not just about conquering fear, he says, but knowing who you are. The volcanic activity was increasing. I was in the forest near Dukono, an active volcano in the northern part of Halmahera island in Indonesia, when I fell into a hunter’s pit. Oh my God, I am going to die, I thought. It was a dark evening but after struggling for an hour, I was rescued by my porters. The journey to summit Dukono had just begun. Climbing volcanoes is about mental, not physical fitness. Of course, you need physical strength, but the problems volcano-climbers encounter are far different from ordinary mountaineers. It’s a different terrain; one you reach after crossing dense and unknown forests, avoiding volcanic vents, ash, quicksands and as I had just discovered, hunter pits. I had climbed mountains before, I had ransacked forests before, but volcanoes, to my mind, were an uncharted and unmapped territory. I was as nervous as I was thrilled. When we camped that night, I couldn’t sleep. The volcano was spewing lava with such great force and noise that it felt as if multiple rocket engines were blaring at once. At 4 am, just an hour before I would start my climb, I heard a loud explosion. The porters tried to dissuade me from climbing but I was determined. I was wearing a gas mask but didn’t have a helmet or volcanic suit. If people thought this was a suicide mission, so be it. I knew that it was an inner, unquenchable desire to climb a volcano, and I was going to do it. As I began the ascent, the volcano kept spewing lava. I learnt that the way to continue climbing was to dodge the lava bombs that were shot in the air. Watch their trajectory and jump gently when they return, I told myself. Do not leap. Volcanic ash had made the mountain slippery and each step had to be controlled, firm and cautious. After three to four hours of careful climbing, I had climbed the first volcano of my life. I was at the summit. It had been a time of peak activity for the volcano and honestly, the moments leading up to it are a blur. But the moment I reached the top, I experienced absolute bliss. And not the bliss I had experienced before, but the bliss that follows the conquering of a long-held fear. It was meditative: an awareness of what’s around me and a complete abandonment of ambition, desire, expectation or self-satisfaction. It’s this experience that has made me appreciate life far more. What made me climb a volcano? The story of deciding to climb into the earth’s heart, the volcano, begins from my childhood. The pressures of the Indian education system had turned me into a rebel, but it was a rebellion filled with curiosity. As a young boy, I would break things at my home, my relatives’ homes, my neighbours’ homes only to try and understand how things were made and how they worked. As a result, I was banished from entering many houses but the curiosity never left me. Typically, when a person is fearful, they run away from the fear but my fear made me inch closer and closer to it till I had seen and held it and surpassed it. If I were afraid of the dark, for instance, I would sleep in the dark. But the greatest fear for me was the fear of death. I understood early that the fear of death has many branches. What if I lose a limb? What if I am compelled to live like this for the rest of my life? Those fears had to be confronted too. When I grew up, I had an existential crisis. What am I doing with my life? Who am I? Where am I going? I was searching for an answer. I had worked hard to become a security and tech consultant but something was amiss. I decided to take up travel. But when I started travelling, I felt that all the places were the same. After a point, the mountains and the beaches morphed into one. It didn’t excite me. I took up endurance biking as well, but got bored of it pretty soon. It was perhaps because I wasn’t scared to try any of these; I wasn’t overcoming any fear. Suddenly, one day, I saw a YouTube video of a person climbing a volcano as lava mercilessly spewed out. Something clicked. It took me back to my childhood when I was watching the movie “Volcano”, especially the scene where a person is engulfed by the lava. It had terrified me and it was a fear that stayed. This was it, I realised. I had to climb a volcano. I thought to myself: choose the most dangerous volcano in the world and climb it. I would use my savings to make it happen. The opportunity came in the form of Dukono. Today, after climbing a number of volcanoes, I can say that it isn’t heroism or a “suicide mission” which people often misconstrue it to be. It’s sheer curiosity. It’s my purpose. But my biggest lesson to people isn’t of merely conquering fear, but conquering fear to know themselves intimately. To lose their biases. I am conscious that I didn’t conquer a volcano but that the volcano allowed me to climb it and gain the experience. I could have been easily killed. Dukono led me on a path of thinking beyond myself, my own limited life, and into the sea of introspection. It allowed me to celebrate my curiosity because when curiosity exists, it outweighs everything else. I know that not everyone can be—or would like to be—a volcano climber, but volcanoes are within all of us, waiting to erupt. It’s about whether we want to give ourselves a chance to think beyond our regular life, break our pre-existing notions and biases, and agree to go on an adventure that suits us. Sai Teja Peddineni is a tech entrepreneur, extreme adventurer and India's first and only volcanic explorer. Seeking thrill in life, he started his career at a young age of 16 and worked with law enforcement, prestigious institutions and the intelligence community. His thirst for thrill and truth made him take up adventure in 2016. 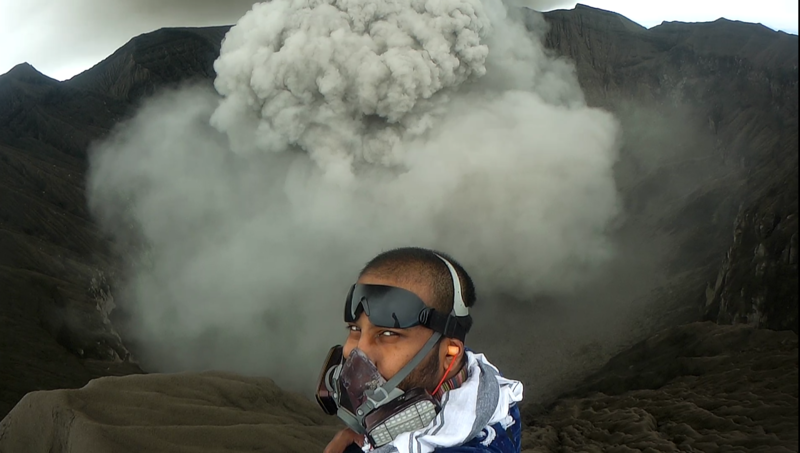 His notable achievements as adventurer include climbing the active volcano Gunung Dukono in April of 2017 and climbing Gunung Agung on 10 January 2018 after it started erupting in November 2017.